AutoWorld GT40 to the left, TLV Mazda 787b on the right. 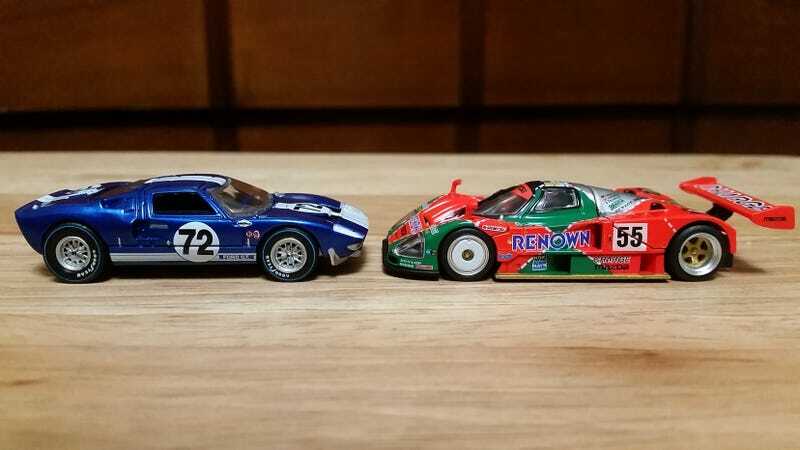 Both precisely 1:64 scale. Dunno if the real counterparts have ever been displayed next to each other, but this gives a sense of scale. The 787b is definitely wider, and in this case lower, though I think AW’s GT40 rendition rides a bit higher than the real deal fire-breathing Ford from the ‘60s. And it rolls amazingly smoothly and straight for having rubber tires on such a small scale. Easily the best rolling rubber tired 1:64 scale car I own.